The coolest ever rock-n-roll romp in a bug's world, capturing all the droll humor and whimsy of the wildly popular books! Insects rule in the diaries of unlikely best friends: Worm, Spider and Fly. Worm eats his homework, Fly believes she has superpowers, and Spider can't wait to grow up and molt. 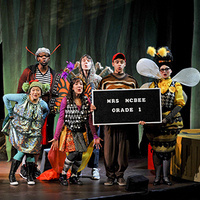 Promoting eco-consciousness, earth science and tolerance of others, DIARY OF A WORM, A SPIDER, & A FLY is a joyful, hip musical exploration of the world outside. You might just find that a bug's life is not all that different from your own! Study Guide coming!